A super-fit shrimp has become a massive internet hit after learning to run on a treadmill as part of a unique science experiment. 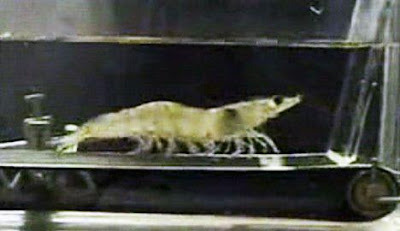 Scientists discovered the shrimp's need for speed after it was placed on a home-made exercise machine in a tank of water to see how far it would travel for food. Scientists were amazed with the results which showed the crustacean could jog at speeds of 66ft per minute and go on for three hours before needing a rest. The bizarre experiment was filmed and later released onto the internet. It has now caused huge waves around the world with more than one million logging on to YouTube to watch the jogging shellfish. Some fans have even put music to it such as the Benny Hill theme tune or Chariots of Fire. Professor David Scholnick, of the Pacific University in Oregon, was one of the scientists who carried out the experiment. He said the project involved putting a sick shrimp on the treadmill first because they wanted to probe how diseases impact their performance. 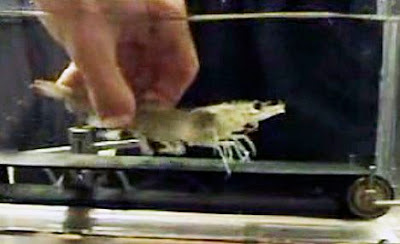 He added: 'We videoed the shrimp so we could compare the performance of a sick and healthy shrimp. 'The healthy shrimp ran and swam at treadmill speeds of up to 20 metres per minute for hours with little indication of fatigue. 'The situation is much more critical for a sick crustacean where a decrease in performance may mean the difference between life and death. 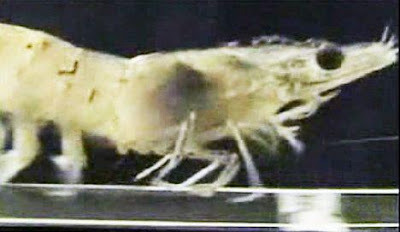 'Shrimp dealing with an infection is less active and limited in its ability to migrate, find food, and avoid being eaten. Prof Scholnick said he was surprised that the four inch long shrimp featured in his video has become so popular. He said: 'Soon after the study someone leaked it on to the internet and it suddenly took off from there. 'So many people have logged on to see it which I suppose is kind of funny - I guess people are fascinated.